A wedding day is so much more than the beautiful décor that surrounds you. While the beauty of your wedding venue and details may be a priority, don’t forget to recognize the experiences and the people that helped along the way! Your wedding is your opportunity to cherish the journey that has made you stronger and celebrate with all of the people who’ve supported you. It’s about honoring your loved ones and giving everyone involved a day full of unforgettable moments. Here are a few ideas you can consider incorporating into your wedding that are sure to bring on the emotional moments and memories to treasure for a lifetime. Who doesn’t love receiving something thoughtful from someone they love that is personal and from the heart? One sweet way to start off the day is with a heartfelt letter to the ones who raised you. A letter would be your opportunity to express your gratitude, remind your loved ones of a memory you share that made you who you are today, and also share your hopes and dreams for your future to come. Give them a thank you for being there for you, for your relationship, and all that they've done to bring you up in the world. Add a twist to a first look with your soon-to-be husband or wifey. A first look has traditionally been something most have imagined as the moment they see their partner coming down the aisle for the first time. Stomachs full of butterflies, it’s hard to imagine a more beautiful or exciting moment in a person’s life. Other ways you can add your own special flair to your nuptials is by having a first touch, first serenade, private vow, or a private prayer. For a first touch, you can save your first look for the aisle, but just link your hands around a corner for an intimate first touch. This makes for a heartwarming moment with your beau and always heightens the anticipation of your first look! Another idea is to use your voices. You can do this by serenading your partner with their favorite song, playing an instrument to your partner, saying a prayer to each other if you're religious, or even recite private vows between the two of you before you have your true first looks down the aisle. You can do any of these or even a hybrid of a few to make the pre-ceremonial events more meaningful. You can also choose to see each other before the ceremony for a private first look moment together. It's a trade for the tradition of seeing each other for the first time down the aisle, but a trade that many couples today are choosing for its advantages. A pre-ceremony first look can help with letting all your tears and emotions out, just between you two, along with giving you two more time to spend together on your wedding day. Bonus points is that it gives you more photos of you two together in an intimate and special way! Have a first look with your parents! This would depend on who is helping you prepare before your ceremony of course (since mom will most likely be helping you get ready!). But if you have the opportunity to take a moment to have a "first look" with Dad, or both mom and dad, before the ceremony, there might be tears, there will be hugs, and they'll love that you took the time to embrace how excited they are to see you on your wedding day. This is the moment they've been waiting for, you know, only since you were born! Have a private moment before the ceremony with your bridesmaids / groomsmen. There are a few ways to build group morale and express your thanks to your bridal/groom party. Before the ceremony, you could take the opportunity to give a speech to your bridal/groomsmen party to acknowledge all the friendships, good times, and memories you share. If you and your team are religious, you can huddle together and share an emotional group prayer for your futures together. If you’d like to be more directly personal, you could write personalized letters to each bridesmaid or groomsman or give any other tokens of appreciation to the people that are your closest friends and family. This is a perfect time to verbalize the appreciation you have and thank your bridal/groom parties for all the hard work they've invested in your big day! Leave each other notes and/or gifts in the morning. What a heartwarming way to wake up to something thoughtful from your future life partner. Write a sweet note of encouragement or an expression of love that they can wake up to and help them start their day off feeling warm and fuzzy inside. You can also add a surprise gift into the mix like a small handpicked bouquet of flowers, a plate of chocolate covered strawberries, something they've been longing for, or even a bottle of champagne to share with your bridesmaids or groomsmen while you all prepare. This is just a small opportunity to bring a grin to your partner’s face before the ceremony while they’re preparing for the experience of a lifetime with you. Leave surprises for each other throughout the day. If you liked the idea of surprising your partner with a note and/or gift in the morning, you may feel inspired to do this for the rest of the day! You can leave surprise notes around where you know your partner will be or even get your bridal parties involved and have them help you deliver secret surprises. You can also go bold and make it a public event in the wedding - I have seen grooms play instruments for their brides, people sing their bae's favorite song, and people have unexpected choreographed dances for their partners with the bridal party. It’ll keep your partner guessing and add an extra element of excitement to your day! Marriage is the ultimate vow and commitment between two people. You can take this opportunity to express the promises you intend to make and keep for the rest of your lives together while embracing the epic love you have for this person. They deserve to know exactly how you feel and your one-of-a-kind vows will make for a beautiful start to your life together. Hearing those words from your person's heart will also help subside some wedding day anxiety and keep you two feeling strong throughout the day. If you'd rather not share your vows in front of an audience, that is 100%OK! Consider having a private vow reading together before the ceremony - you don't even have to see each other for this idea (some examples on number 2 on this list)! Have a meaningful dance for your married guests. Take to the mic to invite your married guests to the dance floor for an exclusive "anniversary dance." The DJ will tell your married guests to start leaving the floor based on how many years they have been together, until the last remaining couple dancing is the longest married couple. All your fellow married friends and family will rekindle the memories of their first dances they shared months, years, or even decades ago on their wedding days. Choose a sweet slow song to dance to, maybe even one that a married couple there whom you might like to honor specifically danced to back in the day! The best part: The last remaining couple on the floor always have the biggest smiles on their faces. Dance with your other parents - new in-laws and grandparents too. What about dancing with your mom when you’re the bride, or your dad when you’re the groom? It doesn’t have to be a slow song like the typical father/daughter or mother/son dance! Take some time to jam with your other parents to your favorite song on air guitar or shuffle the dance floors to your favorite Backstreet Boys song during open dancing at reception. When do you ever get the chance to dance with your family like this? Seize those golden good times for the memory bank. Don't hold back the emotions! 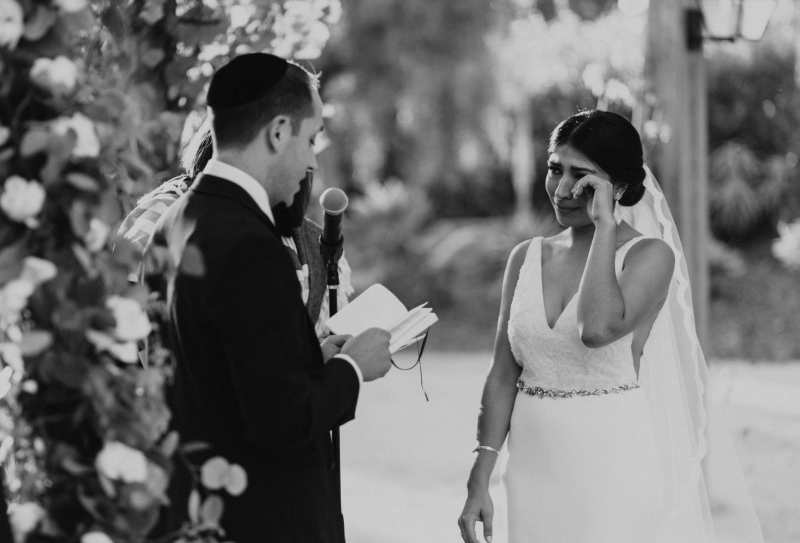 If you're the groom and you see your person coming down the aisle, instead of making that funny face where it looks like you're trying really hard not to cry, let those tears run! If you're a bride who's like me (a total emotional crier) and you want to keep your makeup in tact by the end of the ceremony, I have two suggestions: consider having that first look with each other earlier in the day to let out those feelings and then touch up before you head down the aisle. Just don't hold back! Your wedding day is not meant for putting on a perfect face for the audience. The day is meant for you two. It is meant for embracing the raw, authentic, beautiful, and true feelings of happiness you have for each other. It is YOUR wedding, and it's a safe place to share intimate moments during this once in a lifetime celebration of your love.